CDE’s stand team pose beside the M4500. It will also launch a selection of Infinity screens, the company’s new development in screening technology, along with other technological surprises. 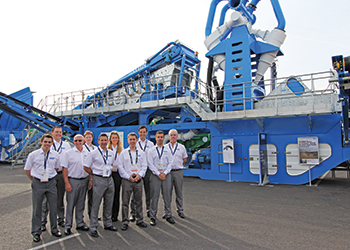 Head of product development Kevin Vallelly says CDE is upping the stakes by unveiling a powerful high-tech sand washing plant dedicated to the needs of the North American market. “Conexpo 2017 is the ideal launching pad for an innovative washing solution that will answer materials washing operators’ needs for more efficient, user-friendly, economical and powerful equipment,” he says. The latest addition to the M-Series, the M5500 combines feeding, screening, washing and stockpiling onto one chassis, and packs an extra punch with unique features. These include a higher capacity of 550 tph, a five-product capability and triple pass cyclone sand washing. Meanwhile, CDE’s new Infinity technology will also be of particular interest to operators looking for sturdier and more economical vibrating screens. These are adapted to applications in both dry and wet screening situations across a wide range of materials. CDE design engineer Neil Mullan sees Conexpo 2017 as an ideal platform to launch the new Infinity screen range. CDE’s materials washing equipment allows for more accurate material classification than traditional sand washing methods, higher quality washed sand, reduced costs of pond excavation, and reduced risks on site. The final product exits the plant ready for use, having been dewatered to 15 per cent moisture. President and founder of CDE Tony Convery says the company keeps adapting to the evolving market demand for even more high-tech, cost-saving, user and environment-friendly materials washing solutions for operators in the construction, mining, industrial sands and recycling sectors. “With an increasing number of operators switching from traditional sand washing machines to more efficient equipment, the North American market has become an important focus in the CDE business development strategy,” he says. CDE Global will be at Stand S5438, Silver Lot 1, at Conexpo-CON/AGG.